Monthly rental price $2,250.00 USD,. No pets. There's a $500.00 refundable security deposit required. We rent by the month only! (1.2137096762 for ?s) (Summer season rates do not include utilities). Housekeeping services can be arranged at additional cost. This stunning home is located on Mexico's Pacific Coast, just below the Tropic of Cancer, in Mazatlan (the name means “land of deer” in the ancient Nahuatl language). HEAR THE SURF in this spectacular, exclusive Marina Mazatlan contemporary residence situated in the exceptional Playa Cerritos beach zone. 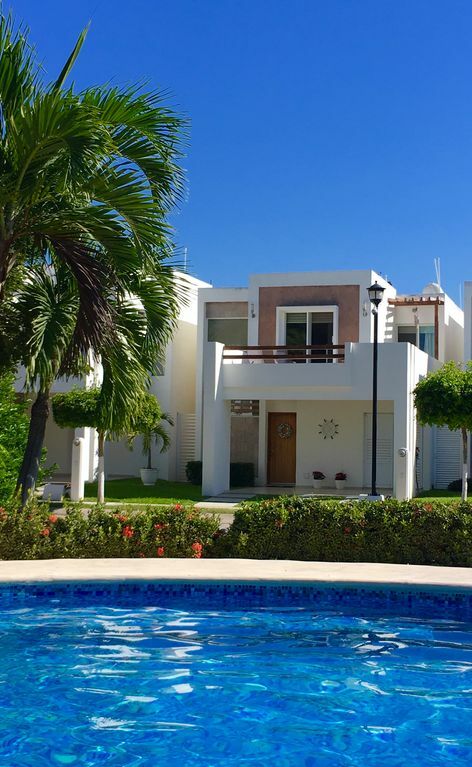 Stylish single-family, 2-story, 3 bedroom, 2 1/2 bath beach villa is within the grounds of a secluded, gated, private residence community named --'Marina Gardens Recidencias Privada,' in the Marina / Playa Cerritos neighborhood with ocean beach access just a short 3 minute walk. The house has water/ marina and mountain views to the east, seen from rear of the house. House is very close to Mazatlan's brand new high end shopping Center: Galerias de Mazatlan anchored by the posh Liverpool store and a new Sears featuring Pier One products , restaurants, a luxury theater and shops. The residence is situated in the exclusive Marina Mazatlan/Playa Cerritos district, Mazatlan's most desired oceanfront area to live. The residence is situated in the gated community of Marina Gardens along the palm lined Avenida Sabalo Cerritos adjacent to beautiful ocean front and waterfront high rise condos and gated private residential communities. Located just north of El Cid and the Marina Mazatlan complexes, the house is near the fabulous 5-star Pueblo Bonito Emerald Bay and Riu resorts, the El Rancho Resort, Torres Mazatlan, Mayan Palace resorts and the luxury residential towers: 360, Tower, Escondido and Las Gavias residential towers. The house is walking walking distance to the famed Golden Zone. On your walk there, you can hop on a water taxi for a 1 minute ride across the marina channel and be at the beginning of the Golden Zone. Immediately across the street in El Rancho Resort is 'La Fonda' restaurant & bar with succulent seafood and dramatic ocean views. You can also choose to eat at nearby Nautica Restaurant or dine at Torres Mazatlan Resort, Catch a 90 peso bus to Punta Bruja and in 10 minutes be eating a succulent seafood dinner. Or, enjoy an expresso at Rico's La Marina coffee shop or at the Last Drop cafe in Punta Bruja. Shop or dine at the nearby Galerias de Mazatlan shopping Centre anchored by the flagship high-end Liverpool Department Store, newly opened in March 2013. In addition, you will soon fine restaurants, a movie theater and other fine shops. Also a short drive away is 'Gran Plaza' with anchor store called 'Cimaco' and 'Sanborne's' and Cineoplis movie complex. For lunch or dinner be sure to try 'Sushi Salad', a local favorite. For supermarkets, the closest is at Walmart. Or you have the choice of two ' , Soriana' of which is a mega Soriana. The Soriana stores are closer to the Golden Zone. For a quick grocery or snack run there are: three mini-supermarkets nearby. One is just outside the main gate. For fun and entertainment just a 5-minute taxi drive or pulmonia ride to the Golden Zone -which is full of restaurants, shopping and nightlife. For culture and entertainment visit the Centro Historico with a fabulous public market, great restaurants at the Plaza Machado or theater at the Angele Peralta Opera House. The house has approximately 1500 square feet of living space. The chic, European-style kitchen is equipped with all stainless steel appliances: Bosch gas range, A Mabe brand wall oven, stainless steel refrigerator, microwave, granite counters and breakfast bar. There is a separate laundry room with full size washer and dryer. The kitchen is completely stocked with pots/pans, dishes, silverware, table linens, etc., should you wish to prepare your own meals. There is a service patio off laundry room with laundry sink. The bathrooms are fully equipped with spacious stall showers. The house is services with a pressurized water system so you have the luxury of great water pressure. Two of the bedrooms are off of an expansive deck where uou can watch the amazing Mazatlan sunsets and overlook one of two sparkling free-form pool, from the Master Bedroom terrace and Queen Guest Room. The third bedroom with two twin beds overlooks Marina Mazatlan Golf Course and breathtaking views of the stunning Sierra Madre Mountains. There are fresh linens and bath towels. Ample beach towels are also provided. The stylish living room and dining room open to private enclosed garden area with umbrella, table and chairs. House is situated in a private community, 24 hour-manned, gate controlled entrance. The spacious grounds of 'Marina Gardens' are filled with gorgeous, lush tropical landscaping, lots of open space, two sparkling swimming pools (one of the two is heated), shady palapas, children's playground and shower facilities. The house overlooks the 18-hole David N. Fleming golf course one of the finest in Mexico and one of the largest marinas in Latin America and the marina lagoon. OTHER AMENITIES: Broadband wireless, Master bedroom has an oversized LCD TV (Satellite is an extra cost to you, please indicate) Sharp TV in kitchen is tied to master bedroom satellite channels. Queen bedroom has flat screen TV with DVD player. Wireless telephones-local/domestic (Mexico only). Stereo with DVD player. IPOD docking station. Bus, taxi and 'pulmonia' stand is directly outside the front gates of the Marina Gardens complex. Merely a minute walk from the house. GOLF: Mazatlan's newest golf course is now open with 18 holes. Back half to opened Dec 2010. Open 7 days a week from 7 PM to 4PM. Golf carts for rent @ $30 USD. Call for tee times or reservations. REFUNDABLE RESERVATION /DAMAGE DEPOSIT $500.00 USD is required on all rentals Your reservation deposit converts to refundable damage deposit on check-in. You will have a walk -through the house with our property manager at check in and at check-out. This is to be sure everything is perfect before and after your stay. At check-out, we receive an email from the property manager and if there is no damage or loss your deposit is returned either by bank check, cash or via PAYPAL. Please write us or call for details. A former Global Marketing Vice President, Owner Kerry Donovan loves to travel the world and enjoys his beach house in Mazatlan whenever possible. A former 22 year resident of Pasadena California, Kerry recently relocated sunny Phoenix, Arizona. I am very selective with whom I choose rent to. I seek only clients who would treat my house as if it were their own home. You'll find the house well furnished and stocked with everything you could possibly need (not like a typical rental). Yo hablo espanol (I speak Spanish) e Portugues tamben (and Portuguese also). Thank you for reviewing my profile and my property. I love the soothing sunsets, warm weather, pleasant people, soft sand, verdant views, tropical islands, magestic mountains...Mazatlan has it all. I immediately fell in love with the Marina Mazatlan area. Everything in this location is brand new. The beach, across the street from the house, is lined with luxury high rises and hotels. The house is directly across from the beach in a private gated community. You'll discover restaurants, coffee houses, and nearby you'll find an upscale mall, supermarkets and shopping. Marina Mazatlan area has it all: restaurants, beach, shopping, ocean, marina, surfing, golf! View of new 18-hole David Fleming-designed Golf Course. Great views of the Sierra Madre Mountains and Cerritos Foothills. The residence sits on the marina lagoon with incredible views of the distant Sierra Madre mountains, Cerritos Foothills, and beautiful greens of an 18 hole golf course. (5) One in each bedroom, kitchen and lving room. Each bedroom has its own remote controlled a/c unit (mini-splits). Two ton a/c remote control unit for first level. All linens, pillows, comforters, etc. provided for 6. Each bedroom has a set of bath and beach towels. Laundry room is located in the house, off the kitchen and is equipped with a full-size gas washer & dryer. Laundry room is equipped with ironing board and iron. Full size gas dryer and washer in laundry room off kitchen. Towels and face cloths are provided. WiFi via Infinitum (via Telmex telephone service) Key code is provided to renters in check-in instruction book. Full size stainless steel LG brand refrigerator. One roll of paper towels and one roll of bathroom tissue paper provided for your convenience. You must restock at your expense. 52' LCD in master bedroom with Home Theater System. Satellite service available: at your cost: One week $25, two weeks $35, 1 month: $50 USD. Prices subject to change. There is a new spacious terrace added to the house off the master bedroom and front facing bedroom with fantastic pool, sunset views and cool ocean breezes. Lush patio off the living and dining rooms. A patio set-includes table and chairs with umbrella located in the enclosed walled garden area. Club de Golf de La Marina. 18 holes. Finest in Mazatlan. One of two sparkling pools right in front of the house. Each pool has a shady palapa, lounge chairs and shaded tables/chairs. Beach access 2 minute walk from house. Golf course, mountain and water/marina and ocean- lagoon view. Gated community with two private swimming pools. Family board game, DVDs and an assortment of paperbacks are provided. This is a well cared for home.Great place! We have enjoyed our stay in his home. Well maintained and location is perfect. Clean, quiet neighbourhood. Great back yard and outdoor pool across the street. The owners are great and very accommodating. A home away from home. There isn't anything you need to bring it has it all. Clean and wel cared for. We recently spent 2 months (March and April) at this Mazatlan house. The house is very beautiful and well maintained. The complex is also very well maintained. It has all top of the line appliances and everything you need for cooking. The Marina location is the newest and most beautiful part of Mazatlan. It is quiet and very clean with 24 hour security. Highly recommend this rental for anyone who is particual and looking for total serenity. gary and frances thomas nanoose bay bc. on arrival we were met by the owner Kerry, who was very friendly and informative. we were more than happy with the accomodations. there is nothing missing or need in this beaultiful and well equipped home. the neighbours were friendly. and the security was very good. in good locaction to beach, store, and medical services. the restaurants in the area were excellent. we would not hesitate to rent this home away from home again and hope to do so in the near future. thank you Kerry for makling us feel so welcomed. i reccomend this rental to to anyone looking for a great place in mazatlan. The house is accessible to famed Golden Zone on foot and via a short water taxi across Marina channel. Fine and casual dining also within walk in distance. Additional $75.00 USD cleaning fee required. Limit of 6 guests. All guests staying at the property must be disclosed to owner including copies of IDs.